It is hard to believe how precious this "Only Us" two stone tanzanite and diamond ring is when paired with a swirl design. The soft 14 carat white gold has touches of elegance. The polished finish makes this ring the perfect and measures 6.5mm in length with a total carat weight of 0.13. 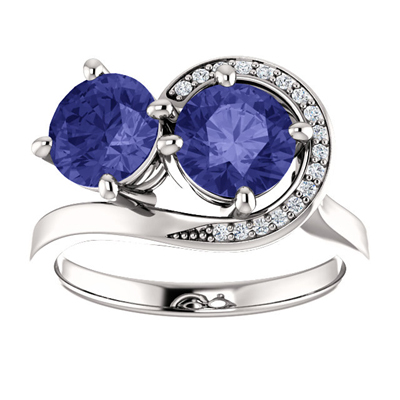 We guarantee our Two Stone Tanzanite and Diamond "Only Us" Swirl Design Ring in 14K White Gold to be high quality, authentic jewelry, as described above.